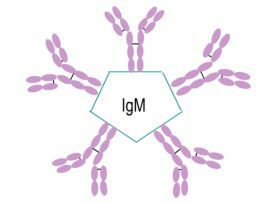 Immunoglobulin M, or IgM for short, is a basic antibody that is produced by B cells. IgM is by far the physically largest antibody in the human circulatory system. It is the first antibody to appear in response to initial exposure to antigen. Immunoglobulins are made up of two heavy and two light chains and heavy chains define the isotype. Amino acid sequence determines the type of heavy chain, Immunoglobulin G has gamma heavy chains and IgM has mu heavy chains. 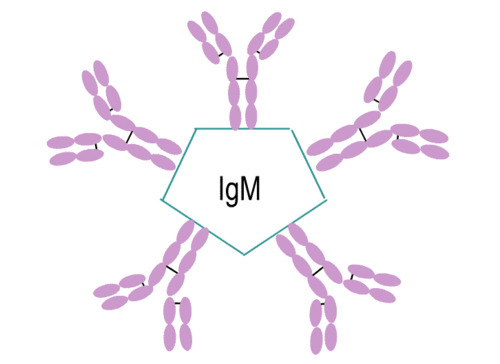 IgM forms polymers where multiple immunoglobulins are covalently linked together with disulfide bonds, mostly as a pentamer but also as a hexamer.